(Above) The Birthday Party as it looked pre 2001 as it sat at the downhill. 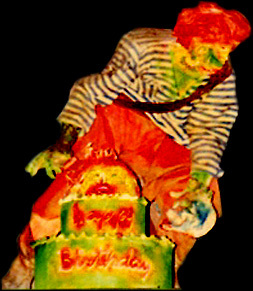 As one of Tracy’s most imaginative and bizarre stunts, the Birthday Party has been a staple in Trimper’s Haunted House ever since its addition in 1988. 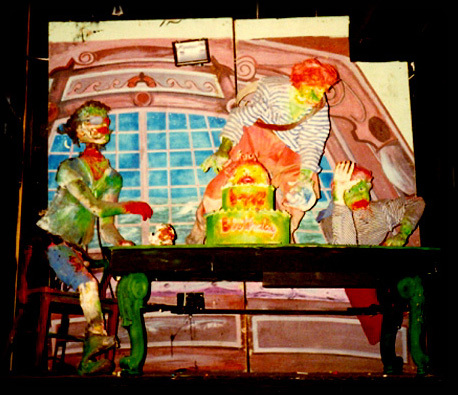 The Birthday Party was originally in Ocean Playland’s Ghost Ship, which was located on 66th street bayside. This stunt, which was moved around to several locations throughout the years, currently resides immediately upon exiting the upside-down room. Although it is one member short and with no animation in its current state, this stunt once thrived as your vessel screeched down the final decent of the ride. When the Birthday party was first introduced to Trimper’s haunted house, it sat upstairs where the Electric Chair currently sits. In the mid to late 90’s, Clifford Hudson and crew built a large shelf-like structure at the downhill and moved the Birthday Party to that location which at one time displayed no stunt at all. This same year, the Electric Chair was introduced to the public and was a smash hit from the very beginning. Originally, the party consisted of four beings. Some say the three man-like beings were distorted clowns; others say they were drunken pirates having a little fun. I will have to lean more on the end of the pirates considering the one is wearing an eye patch and the other two are wearing pirate-like attire. From left to right: A sitting pirate with an eye patch moving his head up and down thanks to a cam motor. I am not to sure how many drinks he had that night, but apparently, it was enough to get him involved in this somewhat perplexing stunt. (Has anyone noticed this figure only has one leg? Maybe the Trimper's didn't think we would notice, or maybe he got it bitten off by a shark. Arg!) In the middle holds the party master—A standing pirate with a spatula in the process of smearing icing all over the cake. When this figure was at the downhill, it had some sort of holster and strap wrapping around his neck and which held a knife to his right. The stunt no longer has this in its current location. To the right, a sitting pirate moving his hand left to right and waving to you as you descend. Last, but not least, a severed head sitting on the cake as an ornament. 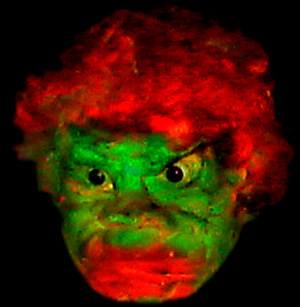 At times, I view it as a child or very short pirate buried in a cake, but I guess to each his/her own. The cake is complete with “Happy Birthday” drawn on the front with icing. In its original state, there was a skull sitting on the far left of the table. To this day, the skull is nowhere to be found. If your mind is rational, you might first question yourself as to why three men are putting the finishing touches on a cake with a head (or child). But, that is Tracy for you—always tricking us with his imagination and brilliance. To the average enthusiast, this is simply another work of art by the industry’s most memorable dark ride builder. The stunt is executed well with its original background which consisted of a façade of a boat deck and a clear night sky. This scenery came from Ghost Ship as well. It now sits upstairs behind the Jumping Ghoul as a backdrop, although one might argue that it is not being used to its fullest potential. When the stunt was relocated to the downhill, two motors were installed to make the pirates on the far ends animated. The motor used was a Dayton motor, Item # 3M101 out of the Grainger catalog. Cams had to be fabricated and modifications to the table had to be made to complete the transformation. When the stunt was originally upstairs, it was motionless and somewhat boring. This stunt and its figures are made predominantly of plaster, papier-mâché, and steel-wire as most of the other stunts are. The Trimper’s re-fiber glassed some parts of the figures when they were moved to add strength, but they mainly remained in their original state. In 2001, the stunt was moved from the downhill to immediately after the upside-down room on the right as you exited to make room for the Gallows stunt that replaced it. In or around 2006, it was moved to straight ahead exiting the upside-down room, and it currently sits looking tired, boring, and falling apart. (Granted, nothing looks more classic and Tracy-like than a stunt covered in grease and years of grime). Furthermore, there is not direct lighting for this stunt as of right now, which only seems to reinforce the fact that its demise may be soon. (above) The Birthday Party in its current location after the upside-down room. It is my hope that this stunt sees an artist in the near future for some refurbishment. With a little time and love, this stunt could be turned around and used to the extent it was years ago. Even with one figure short, some paint, a new motor, maybe some new attire, and a black light, could turn this around 180 degrees. After fixing it up, I would move it to another more prominent location—maybe remove the Vampiress diorama and replace it with the party. 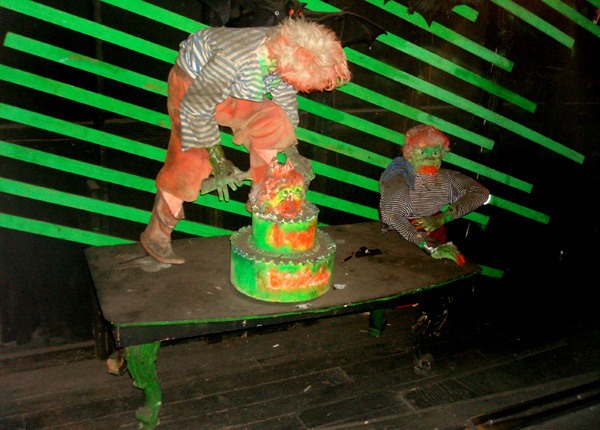 Let’s hope that another Birthday Party will someday be celebrated in the Haunted House with this classic stunt. Below: Actual video footage taken of the Birthday Party.